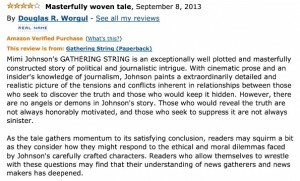 Mimi Johnson’s Gathering String is “an exceptionally well plotted and masterfully constructed story of political and journalistic intrigue,” wrote Doug Worgul, author of Thin Blue Smoke, in an Amazon review. 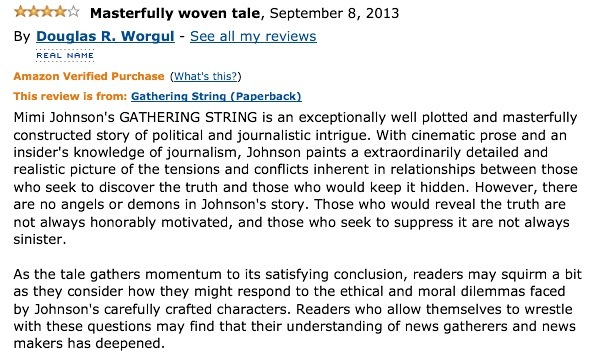 Worgul’s debut novel, like Johnson’s, is averaging nearly five stars in Amazon reviews. 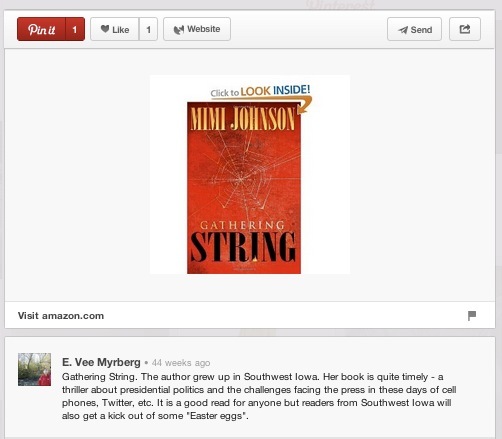 Fans of Gathering String are also sharing the cover of Mimi Johnson’s novel on Pinterest. Tonya Gentry, Joelle Rider, Trixie Shelfbuzz, Kindle Users Forum and E. Vee Myrberg have pinned the book on their pinboards.